Making your home a Hive. Last year we reviewed the British Gas smart heating tech, Hive, and were pretty impressed with it. One thing that actually bugged us a bit about the whole gadget, which allows you to control your home's heating with your phone from anywhere, was that the thermostat looked a tad dated. News recently released by Hive revealed that we'll soon be getting what we hoped for, as well as lots more. 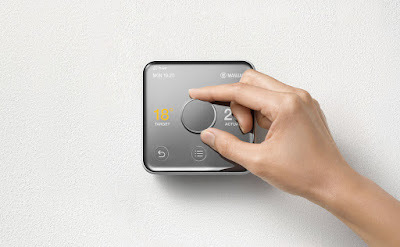 The headline of Hive's latest news is that the thermostat, the one part of the physical system that users interface with, has had a redesign thanks to design entrepreneur Yves Béhar. The 'Hive Active Heating 2' is now much more 'connected home' looking, with a metal body, big chunky knob in the centre, and hidden LED display. It also seems to be somewhat smaller than the previous version, which is a worry - we recently painted the hallway and didn't bother taking the old Hive thermostat off the wall. It'll probably look a mess. But our own DIY failures aside, Hive also announced new app features that users will benefit from (including multi-zone control, holiday mode, and generally better flexibility with hot water), as well as a whole host of new additions to the system. Smart plugs, motion sensors, window and door sensors, and smart lighting in the form of connected light bulbs have all been promised, to be added to the Hive's existing hub and controlled with the Hive app. This really excites us, as we have been using the Hive system for six months now and have always found it very effective. Adding further smart home capabilities to the same system is something we welcome and we really are looking forward to testing some of this new kit out. On that note, if you are existing Hive customer you can get the updated thermostat from August for a special (and short term) cost of £99, while new customers will get the thermostat included in a full installation for £249.